Quality of care for the dying from the perspective of their relatives. The research was initially proposed by Therese Brady, director of bereavement services at the Irish Hospice Foundation. The study was conducted by researchers from the Health Services Research Centre at the Royal College of Surgeons in Ireland on behalf of the Irish Hospice Foundation. The project was conducted in association with the palliative care team at Saint James's Hospital Dublin, Sister Moma Hogan, Sister Sharon O'Brien and Dr Liam O'Siorain. Orla Keegan was project Co-ordinator and Hannah McGee, Director, Health Services Research Centre was co project lead. Initial proposal made by: Therese Brady, director of bereavement services at the Irish Hospice Foundation. Sister Moma Hogan, Sister Sharon O'Brien and Dr. Liam O' Siorain, - Palliative Care Team at Saint Jame's Hospital, Dublin. Hannah McGee, Director, Health Services Research Centre and co project lead. Health Services Research Centre at the Royal College of Surgeons in Ireland. Psychology. Health Services Resource Centre. Initial proposal made by: Therese Brady, director of bereavement services at the Irish Hospice Foundation. Sister Moma Hogan, Sister Sharon O'Brien and Dr. Liam O' Siorain, - Palliative Care Team at Saint Jame's Hospital, Dublin. Orla Keegan- project co-ordinator. Hannah McGee, Director, Health Services Research Centre and co project lead. 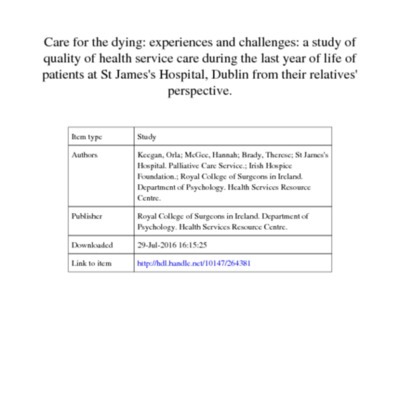 Health Services Research Centre at the Royal College of Surgeons in Ireland., “'Care for the dying: experiences and challenges: a study of quality of health service care during the last year of life of patients at St James's Hospital, Dublin from their relatives' perspective. ',” Archives Hospice Foundation, accessed April 23, 2019, http://archives.hospicefoundation.ie/document/313.